to boring nails. 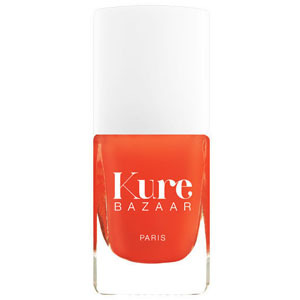 Kure Bazaar non toxic nail polishes. Right now I’m rocking Coquette! It is a perfect red/coral for summer. These polishes have major shine, and dry quick. The formula is up to 85% of natural origin based on wood pulp, wheat, cotton, potatoes and corn. Check out their site to see the range of fashionable colors. So keep your hands healthy while they’re doing no good….